Dylan and his scout troop from Hilo, Hawaii are psyched to be camping out at the base of a volcano in Halape during the summer of 1975. But when he finds out tough, older Louie, with whom he has a history, will be joining them, his enthusiasm is dampened. They start off the camping trip on a rocky start, with Dylan struggling to assert himself as senior patrol leader with the other boys. Then disaster strikes, and the beach paradise they started camping in turns into a nightmare when an earthquake causes rockslides and a tsunami. Dylan, Louie, and the rest of the troop must put aside their differences, rely on their wits, and on each other to survive. This book might be short, but it's a true tale of survival that is based on actual events. As soon as the earthquake hits, we as readers are never sure who will survive, or when they will be rescued. Tensions were high to begin with, but it goes through the roof once the natural disaster hits and people go missing. At first I didn't really like Dylan. He was kind of irritating and petulant. But I warmed to him once he started showing what he was really made of. I liked Louie much more than Dylan from the beginning, mostly because it was clear there was more to him than Dylan seemed to see. He just had a huge chip on his shoulder, and an attitude to go with it. Plus he was not friendly toward white people, or haole. The setting and culture are one of my favorite aspects of all of Salisbury's books. He really infused the Hawaiian mythology into the story; one of the characters says that one of the howling dogs of the title is Pele, the volcano goddess, and a shark is a spirit watching over the island. The dialogue is often in pidgen, creating a strong sense of character and place. 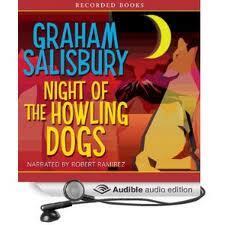 Robert Ramirez did a good job on the narration. At times he sounded like he was accenting words a bit too much, but it was not something that took away from the storytelling. I've listened to him narrate before, and I would have no issue with listening to him again.